ClientEarth has aggressively fought to force the UK government to comply with its legal obligations under EU air laws. Those breaches of EU law are putting the people of London and many other UK cities at risk from the toxic pollutants discharged in the emissions of diesel vehicles, as well as from other sources. A recent study reveals that nearly 40 million people living in UK towns and villages are being exposed to unlawful levels of toxic air pollution from diesel vehicles. Besides the kind of litigation being brought by ClientEarth against the recalcitrant UK government, we need to figure out what other enforcement measures can be brought to bear against this risk. Here is an example, perhaps a model, for aggressive enforcement action against polluting diesel trucks that can lessen the loadings of diesel exhausts threatening people in cities. While the example is from New York, some of the elements of the enforcement can be adapted to cities across the EU and beyond. Outdoor air pollution, from local sources as well as from distant, regional sources, causes or aggravates a host of health effects including heart and respiratory conditions, especially asthma. One of the major sources of air pollution, and a significant contributor to health risks in urban areas, is the emission from diesel trucks. Asthma is widely recognized as one of America’s fastest growing chronic diseases, affecting more than 20 million people. Exposure to particulate matter and ozone in outdoor air can trigger or contribute to asthma attacks, as can exposure to organophosphate pesticides and other pollutants in indoor air. Note 1. In New York City, asthma, as measured by hospitalization rates, presents serious risks especially to children under the age of 14 in low-income areas. Hardest hit are areas of northern Manhattan and southern Bronx, where in some neighborhoods hospitalization rates for asthma reach 167 per 10,000 people, over five times the national average of 31 per 10,000. 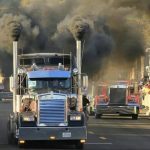 The New York State Department of Environmental Conservation (DEC) developed an enforcement plan to address the environmental risks associated with smoking diesel trucks throughout the city, especially in low-income communities that have been disproportionately impacted by pollution. Note 2. Studies conducted by the New York Metropolitan Transportation Council (NYMTC) of travel to and from the Manhattan Central Business District (CBD) indicated that there are approximately 10,000 truck trips through the East Harlem community each work day. Under New York State law — Smoke Opacity Standards For Heavy Duty Diesel-Fueled Vehicles (HDDV) — it is illegal for diesel trucks of certain sizes to emit black smoke above certain levels. Note 3. Smoke opacity instruments measure optical properties of diesel smoke, providing an indirect way of measuring of diesel particulate emissions. The smoke meters are easy to use in the field. If the truck emits levels higher than permitted, a ticket is issued with fines. Note 4. To reduce the pollution from diesel trucks in low-income communities, DEC created a pilot project for an initiative in East Harlem in New York City. DEC has its own police department that enforces environmental laws and one of the duties of the officers was to look for smoking diesel trucks, pull them over, test for violations of the opacity rules and issue tickets, when appropriate. Thus, DEC officers already had responsibility for pulling over trucks, they had the training to spot and test for smoking trucks, and they had the equipment and training for testing. The initiative involved converting the pullover operations from random acts of enforcement to scheduled and concentrated pullovers. About 12 DEC police cars were assigned pullover operations on the four streets in East Harlem that carry truck traffic, and where the asthma rates were elevated. They deployed each morning for several hours for several days a week for a month at locations which were identified as heavy in truck traffic and had sufficient space to pull trucks over, inspect and ticket. The pullover was operated for several hours each day over several days, at different times of the day because soon after these pullovers are initiated, truck drivers communicate with each other and issue warnings about the police action. In this initiative, DEC invited New York Mayor Bloomberg’s Office on Long-Term Sustainability (and the City’s Department of Environmental Protection-DEP) to collaborate by patrolling the same areas where a pullover operation was implemented and issue tickets to any trucks violating the City’s truck idling law. At the same time the DEC officers issued tickets to idling trucks under the state law. Idling trucks are another significant source of air pollution in these asthma-high neighborhoods. Note 5. DEC also invited several environmental groups, WE ACT for Environmental Justice and the Go Green East Harlem Initiative, as well as the Natural Resources Defense Council (NRDC) to help design and assess the project and provide connections to the local communities. DEC officers pulled over every 3rd or 4th truck for inspection, as well as any trucks that were obviously emitting black, polluting smoke. The attempt was to gather sufficient data from a random field test to estimate the percentage of trucks that were in violation of the law. In this pilot project, DEC law-enforcement officers pulled over and inspected 361 diesel trucks and issued 163 tickets for various violations of state air and safety regulations. The officers also issued 10 tickets for excessive idling. New York City DEP issued 33 tickets for idling trucks. Based on that operation, DEC estimated that close to 20 percent of the trucks traveling the area are out of compliance with state air regulations. With transportation studies showing there are approximately 10,000 trucks travelling daily through this corridor, that means that there could be nearly 2,000 trucks emitting illegal levels of pollutants every workday in East Harlem. 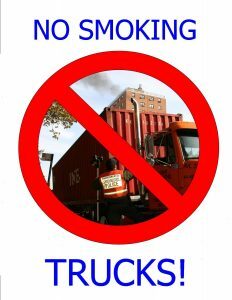 Following the pilot project, DEC implemented the Stop Smoking Trucks pullover operation in environmental justice communities in every borough of New York City as well as every one of the DEC nine regions state-wide. The question now is whether any such enforcement action like the Stop Smoking Trucks initiative could be replicated in European cities. The simple answer is: You’ll never know until you try. the biggest burden was for the DEC police managers to schedule the staff and equipment for each pullover operation. Most EU Member States, or regional or local governments, have car stops to check for drivers’ license, insurance, car taxes, or drinking. So a precedent already exists for pulling over vehicles and conceptually all that is needed is another layer of the inspection for health and environment considerations. There may be existing rules and laws setting standards for levels of pollution from diesel trucks. If there are not, isn’t it time for some. All that is needed is a simple law prohibiting diesel trucks from emitting levels of black smoke, and then enforcement through some training and simple equipment. A recent study has shown that in London a significant source of air pollution is from construction sites, and in particular the diesel diggers, generators and other machines operating at such sites. While waiting for green technology to replace some of the polluting equipment, London’s mayor is planning on introducing a fine, like the congestion charge, to be paid by firms using polluting machines. Should such a fine be enacted, it does not take a lot of imagination to envision an enforcement program that uses existing building inspectors to monitor and enforce such a rule as part of their day-to-day responsibilities. Similar possibilities exist for taking action against polluting diesel trucks on the streets of the European cities. Note 1. A Study of Ambient Air Contaminants and Asthma in New York City (NYS DOH for NYSERDA and ATSDR, May 2006) found a positive correlation between certain contaminants (PM2.5, SO2, O3 and NO2) and acute asthma visits to emergency rooms in the Bronx.